Step one: Click on your username at the top of the page. Step two: Click on "My settings". Hovering over each option here will give you a brief description of what you can do. Step three: You will be taken to this page. Where it says "Friends" there are two options. The first says "Show my friends in my profile". If you leave this checked, people you have as friends will be visible on your AS profile. If you uncheck it, it will not be visible. The second option says "Allow me to approve members before they're added as a friend". 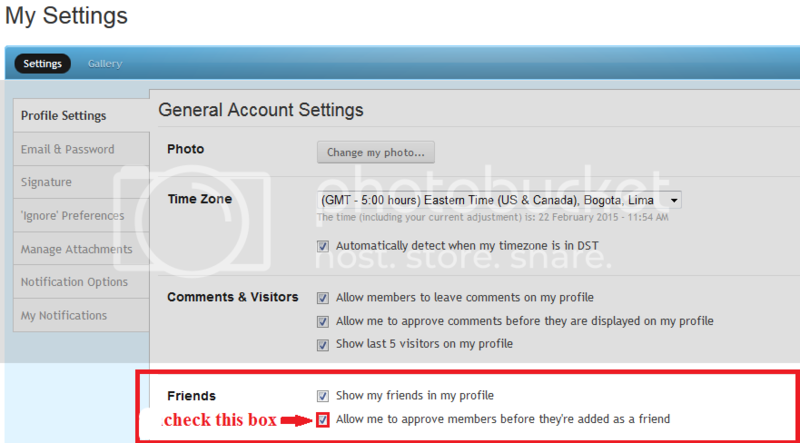 If you leave it UNchecked, members will be able to add you automatically without needing your approval. If you want to be able to to manually approve or deny friend requests, you should CHECK this box. Step four: Always remember to click "Save Changes" before leaving, otherwise any changes you make will not be saved.